Since I started food blogging I have been seeing creme brulee’s a lot. They always looked really good but they sounded a bit intimidating. I am not really sure why I was hesitant about trying to make a creme brulee… maybe it was because I kept seeing recipes that required a blow torch. I recently picked up a large jug of good maple syrup and I was looking for some recipes to use it in when I came across some recipes for maple creme brulee that sounded good. The first recipe that I came across sounded pretty easy and luckily it called for broiling to caramelize the sugar on top rather than a blow torch. The creme brulee was really easy to make. I was a bit surprised that a recipe that contains just cream, eggs and maple syrup changed from a liquid to a semi-solid. The maple creme brulee was so good!! The maple flavour came through nicely and it was smooth, creamy and sweet. The caramelized sugar on top created a thin crispy layer that was a nice contrast in texture. Heat the heavy cream and maple syrup until just before boiling and remove from heat. Mix the eggs, egg yolks and vanilla in a bowl. Pour the cream mixture into the eggs slowly while stirring. Place the ramekins in a baking pan and fill the baking pan with water until it comes halfway up the ramekins. Bake in a preheated 350F/180C oven until firm but still jiggley, about 30-35 minutes. Let them cool and then cool in the fridge until cold. Sprinkle with the sugar and place under a broiler until the sugar turns golden brown, about 20-90 seconds. Maple creme brulee is one of those unreal flavors. The cream and the maple are a match made in heaven. I’m also afraid of the blow torch! That looks great. I love creme brulee. I will have to try the maple. I too have been meaning to make a creme brulee. Perhaps I will try this one, as I just so happen to have some of my dad’s homemade maple syrup on hand. Lovely recipe. Your cooking is so versatile! I love your recipe. I think a blow torch is worth it! Once you get your first kick out of it, you’ll be forever abusing it! I’ll have the crab cake for dinner and the brulee for dessert please! Licking my chops! 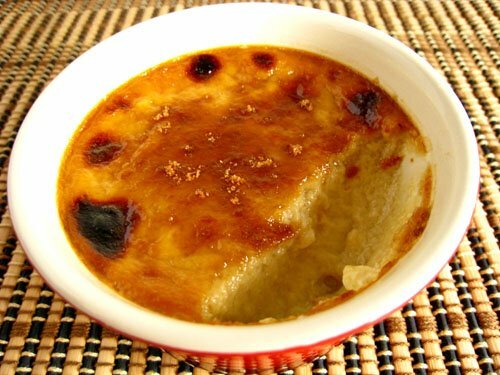 My jaw dropped when I saw that creme brulee – GOR. GEOUS. I’ll have to forward this to a friend who taps her trees-she’ll love it. Between butter and cream vs oil, butter and cream win. Every time. Anyway, butter has a lower melting temp than cocoa butter, so you were doing it right! Oh my gosh- creme brulee is my absolute favorite dessert. I’ve never made it myself. I’d like to get one of those blow torches. I’ve never had Maple CB but it looks/sounds fab. It looks beautiful, Kevin! Creme brulee is one of my favorite things. I just bought a little blowtorch a few weeks ago. I’m still working up the nerve to use it! Hey! That’s a great version of creme brulee. I bet you get really good maple syrup up there in Canada. Yum! wow! I love maple and I love creme brulee but Ive never tried maple creme brulee before. This looks so good! It is giong on my list of must-trys! Perfect! Real maple syrup is one of my favorite things. I’ve never seen a maple creme brulee–great idea. Yum. I just found your blog and bookmarked a bunch of recipes immediately. Your recipes sound great! I am totally intimidated…someone got burned trying to make creme brulee…ouuucccchhhh!!! maple sounds magical, as always kevin! Creme Brulee can be a bit passe, but maple flavoured, suddenly it sounds interesting again 🙂 looks fabulous too! I want a kitchen blowtorch so bad lol. I love making creme brulee- but I’ve never made a maple one. You should send me some of your Canadian maple syrup. Our maple syrup is so expensive. You wouldn’t believe it. Please can u check my blog, I have a surprise!!!!! thats definitely a heaven made combination: maple in creme brulee!! love it!! Good choice to use the maple syrup. I keep passing the torch when I go to the kitchen store and each time I pick it up and then put it back down again. Your creme brulee looks terrific. That looks amazing. I have never made a creme brule, but this is certainly inspiring. mmmm… Maple Creme Brulee… I too need to enter the world of creme brulee making – thank you for sharing your flawless creation as inspiration! A blow torch gives better control, but you’re right, it’s doable under the grill/broiler too. Maple sounds lovely in a creme brulee. Ah, to live in Canada and have access to unlimited, overflowing liquid gold!! :) Sounds incredible! Since I’m not Canadian it’s always nice to have some interesting recipes with maple syrup!!! Thanks! I love creme brulee, and the maple touch sounds delicious! Maple Syrup…the essence of Canada…your broiler did a good job with the top. You’re right we don’t see crème brulée on sites. I bought a torch and never used it yet. I love crème brulée. I’ve never made a creme brulee, but now I really want to try a maple one! Kevin, Kevin, Kevin! You never sieze to amaze me! oh yay! i’ve been hoping to make brulee without having a blow torch around just because pyromaniac or not, i find it very daunting to use it. looks yum! maple syrup is it,man. Now that is a grand flavor combination Kevin I can simple taste th harmony of flavors. I am working on a CB flavor combo myself – if only the recipes would cook themselves from my imagination!! Yum I really love creme brulee! Yours looks delicious. Glad that your first creme brulee making experience turned out well. When I first made it I didn’t have a torch either so just used the broiler method, which works out just fine! Love creme brulee. This maple flavored one looks so rich and I love the crackly maple topping! I love maple CB and yours looks perfect..Thanks for the recipe!